And here's a K31-based 300m ISSF std. rig. Did any aftermaket 10 round mags come about for the K31? Because why not. Ergonomics get way better, and (unlike in the US) K31s in Switzerland are the most common surplus rifle. In very good mechanical condition there's plenty of them for 150-200 Swiss Francs (roughly = USD). Not that I know of. Stgw57 mags cannot be easily adapted, as they don't fit the opening in the K31 receiver. There were a couple of more or less clumsy attempts to make a "Frankenstein monster" by joining the K31 mag top with a Stgw57 body, but nothing even close to market-ready. Is that ISSF stock generally available? Fits the ISSF competition specs just fine (but needs a lower cheekpiece to shoot with diopter sights). As for the ammo and cases, Norma are making them, but they are costly, as hell! The rifles has gained some popularity in Europe, over the past couple of years and the demand for mil-surp ammo is high, but they are quite hard to find. One of my buddies has one, and he has almost given up long range shooting, in favour for this ol' sucker. As you said, Norma brass is excellent, but insanely expensive. Recently, Sellier & Bellot started manufacturing 7.5x55; factory ammo is not as good as ordnance GP11, but the brass is good, certainly better than Partizan. Thanks for posting the link, I'll probably wind up getting some. 10 round mag....out of stock. This year I installed an old Bausch and Lomb 4200 6-24X using a no drill mount ST Marie. As others have commented, once the barrel warms up the dispersion increases. I know this isn't the for-sale section, but I figure it'd be a real 'stars lined up' moment for anyone to catch it on this site's PX. I have taken the Weaver k4w and mount off of my rifle and if anyone is interested in either, feel free to PM me. One of mine. It also has the Type P/S 1,000 yard Diopter attached. I often get that same flier pattern when i shoot my K31 with same set up.It drives me crazy. Any idea why the rifle does this?? Gents, this is the correct sight picture for an offset scope mount for the k31 and for the G11. Sight it in at 25 yards as pictured, and you'll go to 1,000 yards with no windage adjustment whatsoever. The current Guiness world record for a k31 is held by a friend of mine... Ernie Jiminez at 2,000+ yards with a k31 and a 190gr projectile. He had previously set the Guiness world record at 1,000 and then 1,500 with the same k31. Good info sfk55sr! I've got an original K31 still in storage out in Idaho right now that I would love to get my hands back on and go shoot! First time out at the range with mine I was driving tacks at 200 yards with the irons. I didn't have any more distance but I am willing to bet I could have done better. And tbh, I am not an expert shot by any means. The weapon is just so balanced and easy to shoot. Obviously a well made piece of hardware. Still haven't put a scope on it. I guess I better load some 7.5 Swiss and have some fun with my K31! The K31 was my introduction to long range shooting. Back when I couldn't afford much, I could afford a high quality K31. It shot so well I got a second. Then I got a St Marie scope mount and Bushnell fixed 10x mildot. I'd drive out in the desert and place balloons at various ranges. GP11 was plentiful. LOL! That's one of our Scope Mounts. BTW........... That forward ring clamp should be forward right up against the stop on the mount. Good to know though it hasn't moved or lost zero in over 15 years. That mount also allows the use of iron sights and still feeds the stripper clips as well. 15 years! Almost as long as mine. I use the original prototype we made some 19 years ago. Tell me how you zeroed your scope please. For some reason, I prefer the rifle canted so the scope is over bore. IIRC, I used a plum line and put a bubble level on the scope top to get them aligned. No issues with ejection. Zero was set for 100 yards, and I used primitive ballistics charts (whatever was online for GP-11 in the early 2000's) to dial in the Bushnell elite 3200 fixed 10x scope. The attached rendering is the sight picture setup virtually all of us here at SP use for Swiss Rifles as well as for the M1D Garand Sniper. I also use a fixed IOR Valdada 10 power on my zfk55, but that's an entirely different animal. Whichever scope you choose, remember that the lower and closer to the axis of the bore, the better. 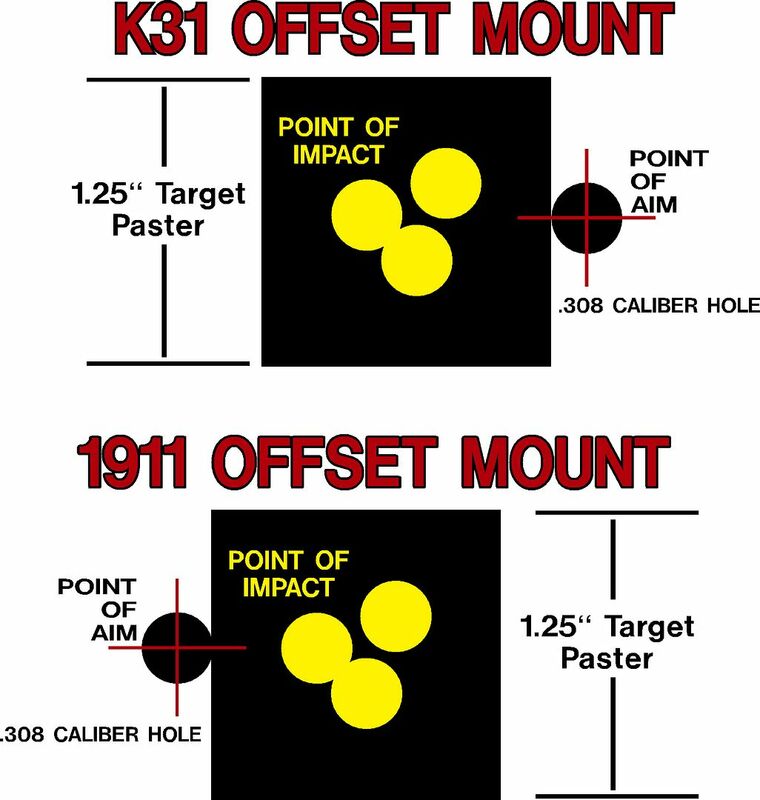 This is the same offset that is used on the M1D Garand Sniper rifle mount. Ummm. Nope. Haemmerli only began regular production barrel making for the Swiss rifles to boost production when war appeared to be imminent. In early years up to the mid 30's Bern made their own barrels. Apparently they still make the K31, not for military use but for civilians. I always thought one, in "6.5 Swiss" (necked down 7.5) would be cool. Yo, Davo. Who is "they"? ...... and di you mean 6.5 Swede? One of the former military manufactures, thought I had read that you can still get K31's in calibers like 308. I was staring at a GP-11 round and couldn't help but wonder what one necked down to 6.5 would shoot like. Im not aware of such a wildcat in existence. "6.5 swiss". Davo, maybe I can clarify. Haemmerli made a number of new k31 runs before they closed their doors forever sometime around 1999 to 2001. Can't remember for sure. OGS is with me more often than not these days. The serial number will be preceded by a "P", signifying Private, however........... It's often confused with the "P" stamped on service k31s that were offered to soldiers mustering out after service that opted to keep their rifles. The easiest way to tell the difference is that the Haemmerli Private rifle "P"s are the same font, thickness and in perfect alignment with the serial number, all in one stamp. The mustering out "P" is almost never the same thickness or perfect alignment with the serial number and is obvious it was stamped after the fact. That means that you. coincidentally had a group from that time period when Haemmerli was making barrels for Bern. I can't remember the year spread when that was more common. ...... and.......... I'd absolutely LOVE to have a k31 in 6.5! The problem is the barrel, of course. As pertains to G11's and k31's......... Ever wonder why 85 to100 year old rifles shows up in the US with a pristine bore and sharp lands/grooves? Never heard of that. In 1990s they did make a very small jubilee run for the 80th anniversary, but it did cost "an arm and a leg". The hi-end century-plus-old design was not made for CNC, and relies a lot on qualified manual work, which got insanely expensive in the meantime. Knowing that there's plenty of perfectly shootable K31s left on the market, I doubt anyone would get in the business of making new ones; that'd be just not commercially viable. 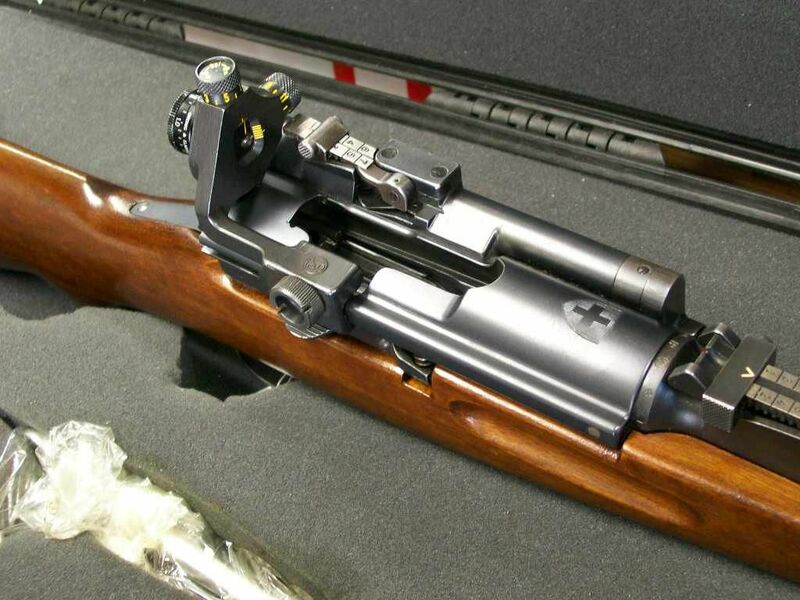 Rebarreling is possible, but significantly more complex than most rifles. The chamber end of the barrel has some funky tight-tolerance stuff machined (a kind of a helicoid "tooth" with a couple of cutouts); I am still looking for a gunsmith with the right tools to get it done with, e.g., a lothar-walther blank. 18" midweight. In 6.5 creedmoor, yes, why not. I was also reloading gp11 with h4895 and 155smk. Back when you could get berdan primers. LOL You mean like these?? Back in the '08 election at the Dulles/Nations gun show when every semi was going for stupid money, a seller in the far corner had a couple of K-31's at $149.95 he couldn't move. End of Show on Sunday I'm looking at them and he told me I could have the pick of the litter for $124.95. Cheapest metal work of art I still own. Bought many bricks of GP11 for, I think, $20 each. Don't shoot her much, but she draws a crowd! No name under the buttplate, oh well.